These make cute Nibbles/Apetitizers for any Christmas Do. They taste divine and will be gone in minutes! Measure the polenta and put aside. Put the water in a pot, add the Gluten Free Stock and season with salt & peppers. Bring to a boil and lower the heat. Sprinkle the polenta over the stock whilst whisking briskly to ensure no lumps form. It will start thickening. Add the grated Parmesan, parsley, nutmeg and butter and stir all in. Pour the mixture onto a cookie sheet and level it with a spatula to about 3/4 to an inch high. Wetting the spatula with a little water helps to make it smoother. Leave for about half an hour to an hour to set. Place the cherry tomatoes in a baking dish, drizzle with a little olive oil, add some salt & pepper and roast them in a preheated oven 200C until the skin starts to wrinkle. Take out and leave to cool. Using a star shaped cutter, cut out stars of polenta. With a smaller star cutter, cut out star shapes out of the mozzarella. Using a large non stick pan, fry the polenta stars on both sides in the strutto (lard) till they are golden. This way they will come crispier. 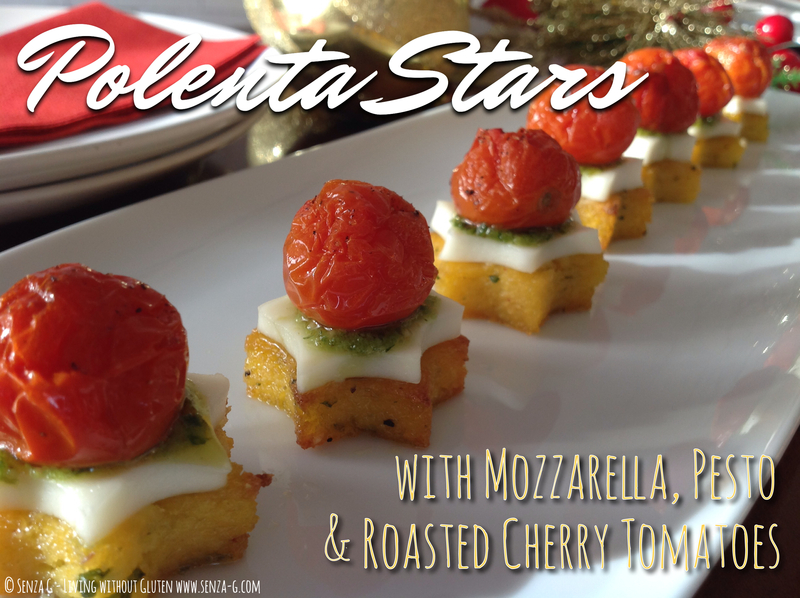 Leave the polenta stars to cool completely before placing the mozzarella cut outs. Place a little pesto on top and a roasted cherry tomato over the pesto. * If you put the mozzarella in the freezer for 20 minutes or so, it would be easier to slice.